A new way to test one of the basic principles underlying Einstein's theory of General Relativity using brief blasts of rare radio signals from space called Fast Radio Bursts is ten times, to one-hundred times better than previous testing methods that used gamma-ray bursts, according to a paper just published in the journal Physical Review Letters. Fast Radio Bursts are super-brief blasts of energy — lasting just a few milliseconds. Until now, only about a dozen Fast Radio Bursts have been detected on Earth. 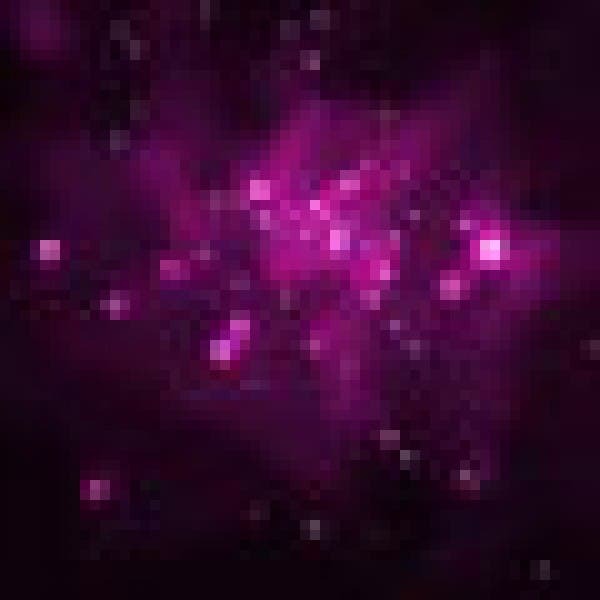 They appear to be caused by mysterious events beyond our Milky Way Galaxy, and possibly even beyond the Local Group of galaxies that includes the Milky Way. The new technique will be important for analyzing the abundance of observations of Fast Radio Bursts that advanced radio-signal observatories, now being planned, are expected to detect. The new method is considered to be a significant tribute to Einstein on the 100th anniversary of his first formulation of the Equivalence Principle, which is a key component of Einstein's theory of General Relativity. More broadly, it also is a key component of the concept that the geometry of spacetime is curved by the mass density of individual galaxies, stars, planets, and other objects. "With abundant observational information in the future, we can gain a better understanding of the physical nature of Fast Radio Bursts," said Peter Mészáros, Holder of the Eberly Family Chair in Astronomy and Astrophysics and Professor of Physics at Penn State, the senior author of the research paper. Like all other forms of electromagnetic radiation including visible light, Fast Radio Bursts travel through space as waves of photon particles. The number of wave crests arriving from Fast Radio Bursts per second — their "frequency" — is in the same range as that of radio signals. The illustration below shows how two photons, one at a high frequency (nu_h) and another at a low frequency (nu_l), travel in curved space-time from their origin in a distant Fast Radio Burst (FRB) source until reaching the Earth. A lower-limit estimate of the gravitational pull that the photons experience along their way is given by the mass in the center of the Milky Way Galaxy. (Purple Mountain Observatory, Chinese Academy of Sciences). "When more-powerful detectors provide us with more observations," Mészáros said, "we also will be able to use Fast Radio Bursts as a probe of their host galaxies, of the space between galaxies, of the cosmic-web structure of the universe, and as a test of fundamental physics." The impact of the new method using Fast Radio Bursts is expected to increase significantly as more of the bursts are observed, and if their origin can be established more firmly. "If Fast Radio Bursts are proven to originate outside the Milky Way Galaxy, and if their distances can be measured accurately, they will be a new powerful tool for testing Einstein's Equivalence Principle and for extending the tested energy range down to radio-band frequencies," Mészáros said. Einstein's Equivalence Principle requires that any two photons of different frequencies, emitted at the same time from the same source and traveling through the same gravitational fields, should arrive at Earth at exactly the same time. "If Einstein's Equivalence Principle is correct, any time delay that might occur between these two photons should not be due to the gravitational fields they experienced during their travels, but should be due only to other physical effects," Mészáros said. "By measuring how closely in time the two different-frequency photons arrive, we can test how closely they obey Einstein's Equivalence Principle." More specifically, Mészáros said the test that he and his coauthors developed involves an analysis of how much space curvature the photons experienced due to massive objects along or near their path through space. 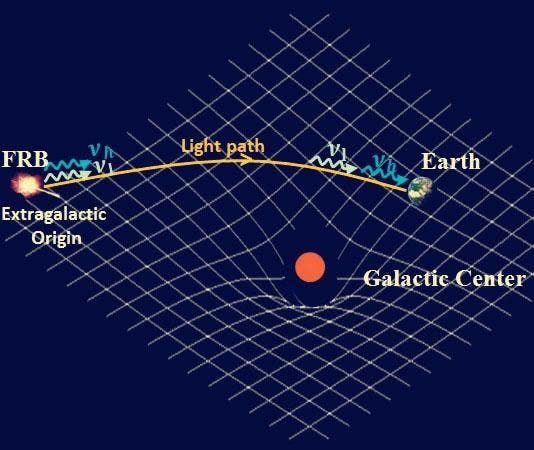 He said, "Our test of Einstein's Equivalence Principle using Fast Radio Bursts consists of checking by how much does a parameter — the gamma parameter — differ for the two photons with different frequencies." Mészáros said his research team's analysis of the less-than-a-dozen recently detected Fast Radio Bursts "supersedes by one to two orders of magnitude the previous best limits on the accuracy of the Einstein Equivalence Principle," which were based on gamma rays and other energies from a 1987 supernova explosion, supernova 1987A. "Our analysis using radio frequencies shows that the Einstein Equivalence Principle is obeyed to one part in a hundred million," Mészáros said. "This result is a significant tribute to Einstein's theory, on the hundredth anniversary of its first formulation." Ancient Supernova Dust Factory Observed at Milky Way Center –"Building Block of the Universe"